I've blogged a lot about Kylie Minogue, but her sister Dannii Minogue's work is just as symbol. Early in this decade Dannii released her most successful record to date, Neon Nights. The first single from that album was the dance hit "I Begin To Wonder". The title itself invokes Alice In Wonderland. The music video starts with Dannii Minogue walking down a street with a bunch of posters of herself on the walls. Everything is a reflection. Being a former Madonna fan, I immediately spotted the Madonna iconography. First of all she she is wearing white lace gloves which Madonna which was apart of Madonna's iconography during the Like a Virgin era which was the same era Desperately Seeking Susan was released. Here's Madonna in a photoshoot wearing the lace gloves. This may seem trivial and irrelevant but as the blog continues the Madonna/Susan connection will make more sense and you'll see why I'm bringing the Madonna connections up. Dannii is also wearing cross earrings which was also apart of Madonna's early 80's iconography. Next we see Dannii as yet another lady in red. Here she's locked inside of a maze type thing, symbolizing entrapment. Of course there's the mirror symbolism. I don't need to explain this, it's so common in these MK suggestive videos. A quick zoom in on her left eye. Here we see Dannii recreating an iconic scene from Desperately Seeking Susan. Here's Susan herself in that iconic scene. The reason the Desperately Seeking Susan comparisons are important is because, as I mentioned in this blog, there are a lot of MK themes in Desperately Seeking Susan. There was also a strange phenomenon of girls "seeking Susan", aka dressing, acting, and behaving like the fictional character which I also went into in greater detail in the Just dance entry. I'm considering doing a full write up on the film. There are a lot of things I didn't notice before like the fact that Roberta is wearing red shoes when she "becomes Susan" in her mind. She also remembers the truth behind the curtain of the Magic Club (magic, wizards). I also want to post this recent photo of Lindsay Lohan recreating Madonna iconic VMA performance. There have been a lot of remale stars recreating Madonna's looks. Maybe Madonna is the new Marilyn, an iconic programmed multiple used to program newer victims. Britney recreated this same performance at the 2003 VMA's during the ritual "kiss" performance. You can't forget the Kabbalah connection. 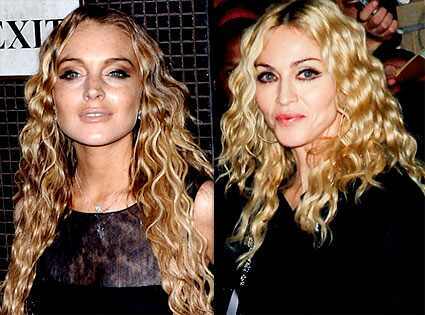 Both Britney and Lindsay followed Madonna and joined Kabbalah in which afterwards they both spiraled out of control. 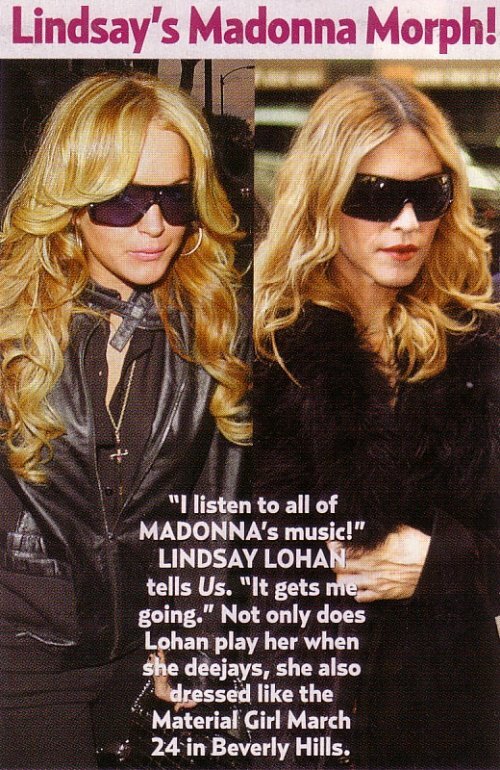 Lindsay has been invoking Madonna a lot in the past few years. and the media is picking up on it. Here she is watching her idol from the front row during Madonna's last tour. It's interesting that all of these girls joined Kabbalah before their media circuses began. Paris performing "Like a Virgin". Bringing it back to Dannii, she continued the Susan ritual in her next video by sampling "Into The Groove" which was the first single from the soundtrack. Check out Madonna's boxing gloves. Also notice the leopard print shorts. I really don't need to post caps for this next video. Just look at the title and all of the mirrors in the video.